Lady and the Tramp & Other Lot (Buena Vista, 1962). One Sheets (2) (27" X 41"). Animation. Starring the voices of Peggy Lee, Barbara Luddy, Larry Roberts, Stan Freberg, Verna Felton, and Alan Reed. Directed by Clyde Geronimi, Wilfred Jackson, and Hamilton Luske. A Walt Disney production. Included with Lady and the Tramp is a one sheet for The Aristocats (Buena Vista, R-1980). 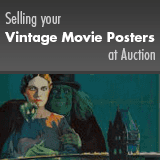 Unrestored posters with bright color and clean overall appearances. They may have general signs of use, such as light edge wear, slight fold separation and fold wear, mild creasing, enlarged pinholes, small surface scuffs, unobtrusive stains and smudges, or small tears. Lady and the Tramp has minor nicks and chips in the borders and upper crossfold, The Aristocats has a noticeable tear in the bottom border that has been repaired with archival tape on the verso. Please see full-color, enlargeable image above for more details. Folded, Very Fine-.